Mobility Seminar Saturday March 30th was a hit! CrossFit Open/Friday Night Lights Winner! Spartan Race – CrossFit Preferred Team! If you know Cass you know she always has a smile on her face. Cass started at our gym almost a year ago and was a little resistant to jump right in. But now she participated in the CrossFit Open, has a goal to be a part of the Committed Club each month and has referred her two best friends Megan Hammond and Danielle Applebach to CrossFit Preferred. We took some time to ask Cass some questions and here is what she said. 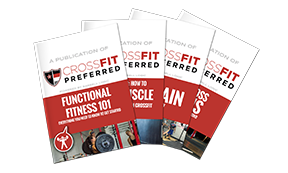 Why do you train at CrossFit Preferred? I train at CrossFit preferred because of the community, and because of the coaches. I truly feel like ALL the coaches have my best interest at heart. They not only want to push me to new limits while working out, but more importantly want to keep me safe in my movements and technique; which is something that’s really important to me. What were you most afraid of when you joined our gym? I was afraid I would look stupid or feel insecure. I was also afraid that I would be the only one who didn’t know what they were doing and always feel like “the new kid.” It’s funny to look back at these fears now and realize how ridiculous they are. Even from my on-ramp classes with Megan I instantly felt welcome and that I could, in fact, do the workouts like everyone else. When I first started I wanted to shed baby weight and generally feel better. But it took Mike a good 4 months of begging me to go before I decided to give it a try. Feeling my best will always be a goal of mine. But now after going for almost a year, I just want to keep getting stronger! I always thought weight lifting was only for men and thought it was weird when women were interested in that type of workout. Now I understand the huge improvements its brought into my life and overall health. How has your focus on nutrition helped you? I can’t believe how much better I feel on a daily basis. I got so used to eating terrible and didn’t even realize I didn’t have to feel sluggish and tired throughout the day. I’m also proud that a focus on nutrition has blended into my family and what we eat at home. I’m excited to show my son how to fuel his body with food that can improve his life. Has your strength improved? If so how? YES! My husband used to make fun of how weak I used to be. I legitimately wouldn’t be able to lift a pot of pasta off of the stove…. To think that I can now back squat over 100 pounds is pretty hilarious and exciting. Has it helped your mindset? Absolutely. I used to DREAD going to the gym, not just CrossFit but any gym. The thought of shifting how I ate was daunting and unobtainable. But once I realized I don’t have to be the best at those things right away, my mindset changed. I can just chip away at small goals one day at a time and I’ll see dramatic changes over time. What is your favorite part of the gym? Feeling strong and starting my day off in a great way with great people! I never regret working out, but will often regret or feel sad if I don’t go; because I genuinely miss it! I love seeing people hit a PR or reach new goals, it’s so motivating to see change in other people. We love having her a part of our CrossFit Preferred Family. It has been so fun seeing her learn and get stronger everyday! Nice job Cass. Note – “Odd Object” conditioning will be utilized 1-2x per week, which can consist of sled pushes, drags, Wreckbag work, and dumbbells/kettlebells. It has been designed however, with the limited equipment athlete in mind. We won’t need to move to purchase new gear for this cycle – that is not the intentions. For each “odd-object” session, we will be sure to list recommended modifications in the event we don’t have the equipment. Last Mobility Seminar Covered It All! We had a great mobility seminar Saturday with Cat and Shayne from Therazona Physical Therapy! We started with feet and ankles, calves, quads and finished up with hips! It helped all of us that attended feel great and we learned some new ways to stay more mobile and healthy. Thanks Cat and Shayne for leading this seminar! We all enjoyed it and had a great time! CrossFit Open/Friday Night Lights Team Winner! Congratulations to Indigo Show for winning this years Friday Night Lights. It was a really close race between them and Jacked & Tan. We want to thank everyone who participated this year in the CrossFit Open Friday Night Lights. We know many of you spent hours helping judge, cheering your teammates on, taking and uploading pictures, and we really appreciate it. This was our biggest year of participation yet! Thank you! Thanks to everyone that came out to our CFP Barbecue on Friday Night and brought something to share. And a special thanks to Coach Tara’s husband Ryan for being the grill master once again. He is seriously the best and provided all of us with amazing food! 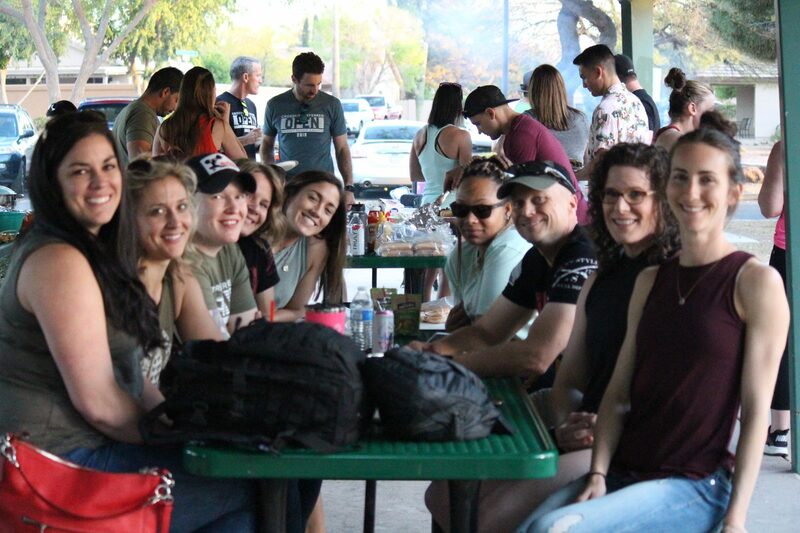 We love hosting events outside the gym so we all have a chance to get to know each other on a more personal level. We realize that life is busy so we appreciate all those that made an effort to come. And of course we had to get a pic of Indigo Show with their Champions Trophy! Congratulations guys!! Congratulations to Branden Sparks who is our February Committed Club winner. Branden won $50 credit towards any retail item at CFP! What is it The Committed Club? If any of these topics resonate with you please jump on and ask us any questions you might have. If not join us anyway! You will make it more fun! Join us this Saturday for the Juvenile Diabetes Research Foundation Run! Member of CrossFit Preferred Sue French is helping set all of this up and has helped us out with a discount code! This is for a great cause! Let’s help support it and have fun running together! Join us for the Spartan Race in June in the Cardinals Stadium. It is a indoor race! Can’t wait! We have created a team with a very creative name of “CrossFit Preferred” Join us!! It will give you a new goal and you will have a blast!! Great job to everyone that has focused on their goals the last three months! We can tell that it is making a huge difference for those that are focusing and working towards achieving their goals! Now that it is April lets write up a new goal and get to work on that goal! Keep up the great work! Hope everyone has a great April!